A new meta-analysis has shown that cardiovascular benefits of aspirin in the primary prevention population are balanced by the risk of bleeding. The authors, led by Professor Kausik Ray (St George’s University of London) conclude that the modest benefits and the significant increase in risk of bleeding do not justify routine use of aspirin in primary prevention, but that aspirin may be considered in certain higher-risk groups. The recently published meta-analysis (Arch Intern Med 2012;172:209–16), included nine randomised placebo-controlled trials with a total of 100,000 participants. 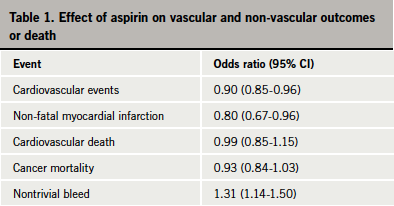 Results (table 1) showed that during a mean follow-up of six years, aspirin treatment reduced total cardiovascular events by 10%, driven primarily by a reduction in non-fatal myocardial infarction (MI), but there was a 30% increased risk of non-trivial bleeding events. The number needed to treat to prevent one cardiovascular event was 120, compared with 73 for causing a non-trivial bleed. The current study did not find a significant reduction in cancer mortality, but others have pointed out that a longer study period would be necessary to show an effect on this end point. And a previous meta-analysis has shown a reduction in cancer mortality with aspirin. But Professor Ray says the cancer data are still very preliminary, and at present the decision whether to take aspirin as a healthy person is governed by cardiovascular risk, and for most people the risks probably outweigh the benefits.